The Global Volcanism Program has no activity reports for Jumaytepeque. The Global Volcanism Program has no Weekly Reports available for Jumaytepeque. The Global Volcanism Program has no Bulletin Reports available for Jumaytepeque. The Global Volcanism Program has no synonyms or subfeatures listed for Jumaytepeque. Jumaytepeque is a small basaltic stratovolcano located NNE of the city of Cuilapa, north of the major NW-SE-trending Jalpatagua fault that cuts diagonally across SE Guatemala. The volcano was constructed near the SE rim of the large Miocene Santa Rosa de Lima caldera. It is not overlain by a ca. 23,000-year-old tephra unit from nearby Ayarza caldera, and its erosionally unmodified form suggests that Holocene activity is possible (Reynolds 2007, pers. comm.). Two older cinder cones to the north are covered with Ayarza tephra. Reynolds J H, 2007. (pers. comm.). The Global Volcanism Program is not aware of any Holocene eruptions from Jumaytepeque. If this volcano has had large eruptions (VEI >= 4) prior to 10,000 years ago, information might be found on the Jumaytepeque page in the LaMEVE (Large Magnitude Explosive Volcanic Eruptions) database, a part of the Volcano Global Risk Identification and Analysis Project (VOGRIPA). There is no Deformation History data available for Jumaytepeque. There is no Emissions History data available for Jumaytepeque. 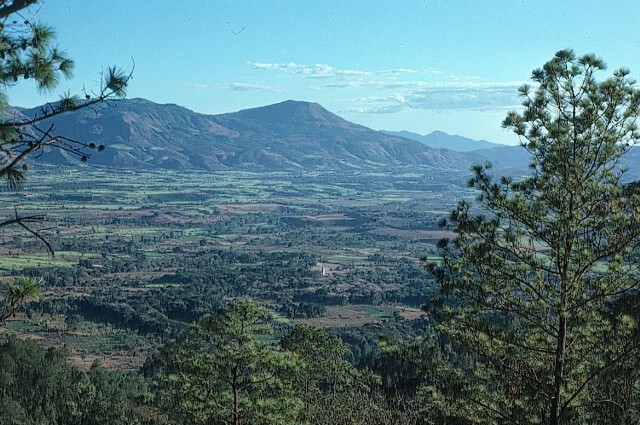 Jumaytepeque, on the center horizon, is a small basaltic stratovolcano that is seen rising to SE from a resurgent dome of the Miocene Santa Rose de Lima caldera. The 1815-m-high Jumaytepeque volcano was constructed near the SE rim of the caldera, and its youthful profile suggests a possible Holocene age. The volcano on the far horizon to the right of Jumaytepeque is Ixhuatán volcano. Photo by Jim Reynolds, 1975 (Brevard College). There are no samples for Jumaytepeque in the Smithsonian's NMNH Department of Mineral Sciences Rock and Ore collection. Large Eruptions of Jumaytepeque Information about large Quaternary eruptions (VEI >= 4) is cataloged in the Large Magnitude Explosive Volcanic Eruptions (LaMEVE) database of the Volcano Global Risk Identification and Analysis Project (VOGRIPA).